But then I go right back to taking it back, because whenever I do have good dreams, I just want to stay asleep and see how it pans out. Not only that, someone once told me that if you dream, that means you had a good night’s sleep. Now that I’m back home from my long day at work, I look forward to tasty foods like this here dinner roll. It’s small enough to be a small snack, but big enough to make you feel tons better… especially if your weakness is bread, like me! As I probably said in all my (one) yeasty bread posts, I love to see how big the dough gets when it rises. 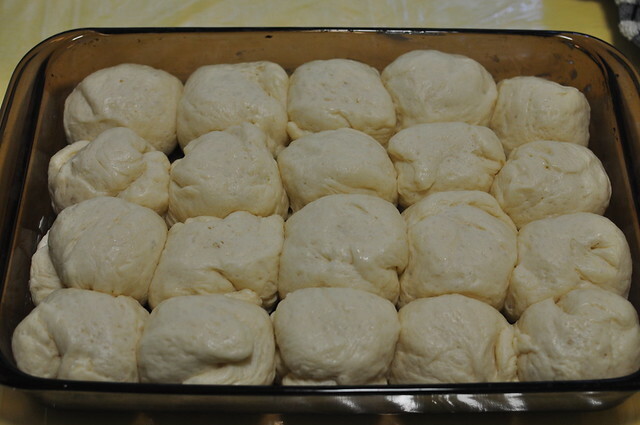 This is the dough… after. One of these days, I’m going to get a picture of the dough before it rises. I promise you. This will not be the last of my yeasty posts. You gotta butter ’em too… to get that buttery bread most everyone loves. Buttering the top also browns the top, making it slightly crispy. 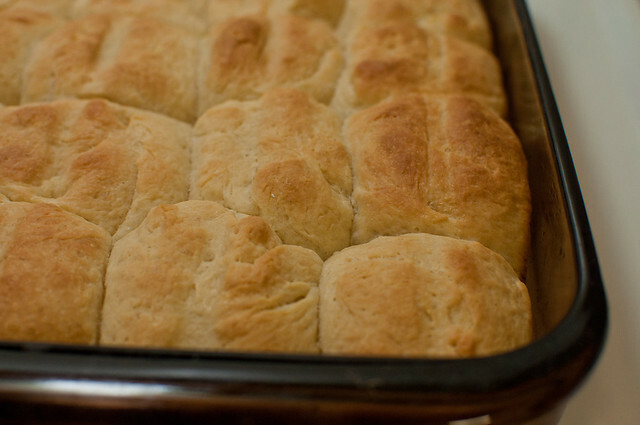 If you make these, you’ll learn how dinner rolls are baked in just one pan. I used to wonder how companies would make dinner rolls attached together… but it can easily be pulled apart. so smart! Eat a couple of these little rolls, and you’ll be asking for more. 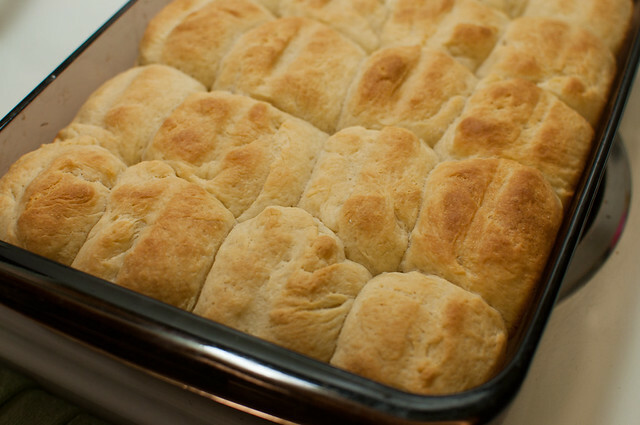 Bread is just plain comforting… but buttery dinner rolls is even better! Stir together warm water, 1 tablespoons sugar and yeast in a small bowl until yeast in dissolved. Let stand until foamy, about five minutes. If the mixture does not foam up, throw it out and start over with some new yeast. Melt 3/4 stick (6 tablespoons) butter in a small saucepan. Add the milk and heat until lukewarm. Pour into a large bowl and add yeast mixture, remaining 2 tablespoons of sugar, bread flour, and salt. Mix with a wooden spoon until just combined. Stir in 3/4 cup all-purpose flour, and mix with a stand mixer fitted with a bread hook. If your dough is too sticky to handle, add up to 1/2 cup of all-purpose flour a tablespoon at a time until the dough is just slightly sticky. Knead dough with the stand mixer on medium speed until a smooth and elastic dough begins to form, adding more all-purpose flour as needed. I used the same method from this recipeto judge if the dough is ready. 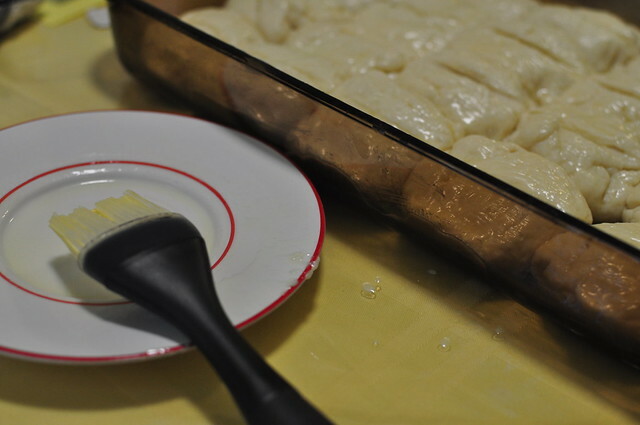 “Tear off a small piece of dough and flatten into a disc. Stretch the dough until thin. Hold it up to the light and look to see if the baker’s windowpane, or taut membrane, has formed.” The dough will be smooth, satiny and just slightly sticky after 10 minutes. Form dough into a ball and place in another large, buttered bowl, turning the dough so that the entire ball is covered. Cover with plastic wrap and a towel and let rest n a warm, draft free place until doubled in size, about 1 hour. Butter a 9×13-inch baking pan. Divide dough into 20 equal pieces. Roll each one into a ball and arrange evenly in 4 rows of 5 in a baking pan. I rolled each ball on the table with both of my hands so it has more of a chance to be round. Joy makes it look so easy! Cover loosely with plastic wrap and let rise in a warm, draft free place until almost doubled in size, about 45 minutes. Using a floured chopstick or the edge of a ruler, make a deep crease down the center of each row of rolls. Let rolls rise, loosely covered for 15 minutes. Preheat oven to 375 degrees F and place a rack in the center of the oven. Melt the remaining 2 tablespoons of butter and cool slightly. 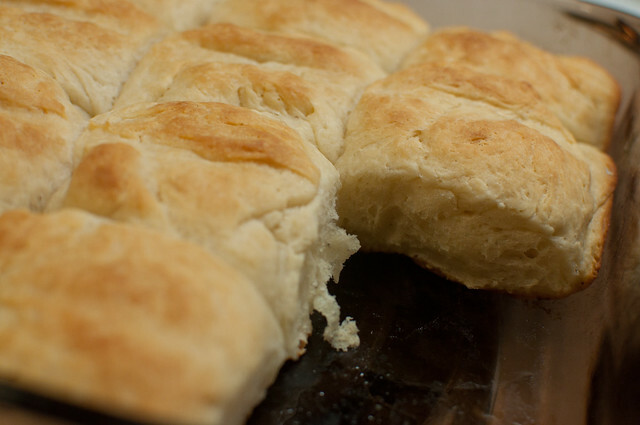 Brush the tops of the rolls with butter and place in the oven for 20-25 minutes, until golden brown. Cool rolls in the pan for 5 minutes then remove and serve warm.